Bogus charges added by greedy dealers. It means "Additional Dealer Markup" or "Additional Dealer Profit," and appears on a sticker next to manufacturer's MSRP sticker. I call it Arrogant Dealer Markup. ADM is an artificial buffer to bargain down the price. If ADM is $1,000 and you talk them down $800, you still paid MSRP plus $200 for the car! If you see this toxic waste, have them nix it. One buyer of a Honda Civic got the dealer to drop a $1,995 ADM! Car makers charge dealers for regional and national advertising campaigns. These charges are reflected on the invoice and are a legitimate cost of doing business. This is where opinions differ, as I feel it's their cost of doing business, not ours. Tell them to pay your fees like gas, wear and tear and your time for driving all over town to shop for the car. Many dealers are sticklers about this fee and it's difficult to get them to drop it, but some do waive the fee. If a dealer adds on their own advertising fee above and beyond this, they are out of bounds. Dealers try to charge $250-$1,000, but it should not be more than $250. You're not paying for their inability to find cost effective ads. $1,000 ad fees allow the dealer to charge you a lower price on the car. You think you're saving money, but ad fees take it right back. This fee may also show up as "Sales Promotion Fund," or DAA, or ADA, or anything referring to ads. What angers me the most is the cryptic way that dealers hide this fee from you by using huge acronyms, then playing stupid when you question it. "Duh, I don't know, we always charge this fee." A Nissan Dealer in Chicago told one of our visitors that they have to charge the Nissan advertisement fee and can't drop it or they can face a class action law suit. Nice scam. Ford dealers use the cryptic term "FDAF/LMDA" on their invoice. "FDAF" stands for "Ford Dealer Advertising Fund," and the "LMDA" stands for Lincoln Mercury Dealer Advertising. Why can't they just disclose it as "ad fee?" Honda ad fees are built into the invoice price, don't let them charge you extra. Other companies choose their own cryptic acronym, like DAA (Dealer Area Advertising), TDA (Toyota Dealer Advertising Fee), HDA, you get the picture. If it ends with an "A" it's most likely an advertising fee. Speaking of advertising, dealers are neither grateful nor shy about plastering their name on the trunk of your shiny new car at a cost of $0 to them. You then spend the next several years advertising their dealership free of charge with your moving billboard. You should charge them a $600 advertising fee for that. Some dealers charge this fee, which is icing on the cake. Have them remove this insult. Dealer Floor Plan Interest is the interest that dealers pay for loans to buy the cars on their lot. Usually the factory pays this as part of the holdback, itemized as a separate invoice item. Floor Plan interest can cost $150 per month for each car. On an Eclipse invoice I have, the factory gave the dealer $185 in floor plan assistance, and the dealer itemized it to the buyer as a fee, double collecting for $370! The factory gives the dealer 1-2 months of interest. 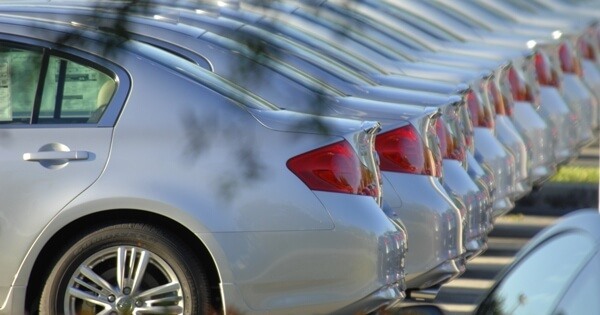 The longer the car sits unsold on the lot, the more $150 interest checks the dealer pays. They want you to "assist" them in "paying it," which is the factory's expense, not yours. Dealers know we are on to them, so some have changed the name to a confusing term called "Wholesale Financial Reserves" or "Dealer Interest Fee." Dealers in Hawaii charge a "DEALER MARKUP VALUE," fee of $1,000-$5,000 over the selling price. They claim it offsets "high" transporting costs from the US mainland to Hawaii. Our visitors have bought cars in Los Angeles and shipped to Hawaii for $895. If my geography serves me correctly, Japan is closer to Hawaii than the US, so it should be cheaper to send Japanese imports from Japan to Hawaii. I suggest you let them charge no more than $600. The most common scam, because it's so believable. They act like a team of NASA experts performed a 3 day 15,000 point check of your car. Dealer prep "covers their cost" of removing plastic films on the seats, vacuuming the car and preparing it for sale. Last time I bought a new car it took the dealer 2 hours to peel the film, remove cardboard, install fuses, check the liquids, perform a 10 mile test drive and hand me the keys. If a dealer charges a $500 dealer prep, you're paying them $250 per hour! Are you boiling mad yet? Often it's permanently printed on the buyer's form to make you think it's mandatory, but nearly everyone I know is able to make the dealer drop it by adding a credit to the next line. If they refuse to remove it, just walk. Tell them you want to see if the other local dealers will drop the fee. Dealers pay a destination charges to have cars delivered on auto transport trucks. For my 1998 Lexus SC300, it's $495, passed on to us. This is one of the few legitimate fees. Verify the amount with online pricing sites before you go in to buy. Expenses like registration, tags, title and other state fees. Determine the fees your state charges before you go shopping. Call the Department of Motor Vehicles to determine the cost of registering a new car and getting the tags if necessary. It may be cheaper to transfer the tag from your old car to the new one. Once you know all documentation fees, determine if the dealer is padding the charges. Have the salesman give a breakdown of every fee in writing. A bogus fee that the greediest dealers pile on customers. The purpose of this fee is to steal your rebate from you. One visitor had a $900 rebate on his car, but the dealer stole it right back with a $900 drive off deposit. What does "Drive Off Deposit" mean? Nothing, it's a meaningless term. If you see a drive off deposit on your worksheet, just drive off, no deposit. This is a legitimate fee to speed up the registration process, but it can quickly turn into a scam. Legitimately, the fee should be well below $100. There is a recent phenomenon of dealers overcharging ridiculously for this fee. We've gotten reports from many of our readers that they have been charged several hundred dollars or even over a thousand dollars. The dealers try to make it seem like a required government fee but it is not. If this fee is more than $100, you've got to get them to reduce it. If they won't, walk away from the deal! A stupid fee for etching the VIN# or other anti theft information into your side windows. It costs next to nothing for the dealer to do it and the average fee is about $300. You can buy same kit in auto parts stores for $20 and do it yourself. This is a sum of money that the manufacturer "holds backs" from the dealer until the car is sold. Depending on the manufacturer the amount will vary. It can be base on either MSRP or Invoice Price and typically ranges from 0% to 3%. For US auto makers pay dealers the "holdback" is 3% of MSRP. Mercedes pays 3%, Lexus is 2%, but Edmunds claims Lexus has no holdback. BMW, Japanese imports, etc., pay 2% quarterly to the dealership. It's called holdback, because the factory holds back money from the dealer until they sell the car. This is accounted for by charging the dealer for holdback on the invoice, paying them back when the car is sold. On a $30,000 car the holdback is $900. This appears to you and me as though the dealer paid $900 more for the car than he did. This is done by the factory as a means to compensate dealers for interest on loans that they take out to buy the cars from the factory and also to provide some profit for the dealer. The holdback is included in every invoice price. This is how dealers can sell you a car at invoice, because the factory refunds them the holdback once the car is sold. They can sell you a $30,000 car at invoice and have a $900 positive cash flow. Many people don't know holdback exists, including many car salesman, as this goes directly to the dealer and it effectively reduces the dealer's cost of the car. Many dealers deny it exists or tell the customer it's a dealer expense. It's the factory's expense once the car is sold. If any dealer tries to itemize you separately for holdback, leave immediately, you'll surely be subject to many more unscrupulous tricks. Don't let a dealer tell you there's no holdback, it's the business model that the whole industry is structured on. Many good car dealers list holdback on their web sites. These are fees for prep or options installed at the port of entry by the manufacturer. For example, Toyota has a Port Installed Option added to the cars once they land in Florida called ToyoGuard, an extremely overpriced rubberized coating sprayed inside your wheel wells to prevent rust. This can add up to $600 to the cost of your new Toyota. Some port prep fees might only be $25. These fees vary by manufacturer and port of entry. That's a tough one to determine, each state is different. There may also be small tire and battery fees around $10 levied by the state. In Florida, it's cheaper to transfer your plates from your trade-in to the new car, about $85 instead of over $400 for new plates. Some states charge hundreds, so check with your DMV before going shopping. Print out the DMV fees online and bring them to the dealer. Quite often dealer charge up to $400 "document fees" supposedly to handle paperwork transfer of the plate, done by their lowest paid secretary. Buyers in Washington D.C. buying a Volkswagen said the dealer tried to charge a $175 Washington Association Fee claiming it was "the cost that the manufacturer charged them for doing business in this area." We don't know if this is a valid fee or not. It sure sounds like a bogus charge to me.